Robin was born in a nursing home just outside of Hitchin, in Hertfordshire on 28th January 1938, his parents at the time living in the village of Arlesay near Royal Air Force Henlow where his Father worked. Robin's parentage was of a mixed background, his father, although born in England came from the Clan Gordon of Scotland, and his mother was a Crow [North American indigenous people] of the Blackfoot Nation from the Plains of Dakota, Mid West in the U.S.A. Robin was given his name by his Mother, Robin Charles Sherwood Todd, Charles after a favourite Uncle, Sherwood is given to the first son of a first son, Todd from the Clan Gordon [Tod, Todde, Fox]. Robin & Susan did in fact meet up with Julian at Susan's wedding when Julian was 12 years old, and later, actually all got together again recently on the 17th February 2016. A family once more. From 1978 to 1990, Robin owned his own Company (in partnership), this was known as L.J.R. Telecommunications Ltd, Robin being the Director of Operations, and 1990 to 2003 worked self employed as a Telephone Systems Installation Engineer. He retired in March 2003. During his R.A.F. career he sailed for the Royal Air Force, the Combined Services and England, and continued to sail until 1999. He was also very keen on Archery, this to establish a keen interest in a sport with his son Adrian, who became a very highly prized winner in the UK during his 14th year. Then in Karting, again to establish a keen interest in some kind of sport with his grandson Adam, who became the UK Champion of Junior ProKart [Honda Twin Engine Karts] Racing during his 14th year. Bro Robin was Initiated into the R.A.O.B on 21.9.1970 in the El Firdan Lodge, Limassol & District, Cyprus No.2 Province. [By his friend and mentor Bro. Eric Herbert ROH GP2001 G.Tru.]. He gained his 2nd Degree, Primo, on 20.11.1971 in the Vale of Bourton Lodge, Gloucestershire Province. His 3rd Degree, Knight Order of Merit, on 25.1.1975 in the Central Lodge, Luton & District Province. From January 2006, Ex-officio Officer G.L.E. 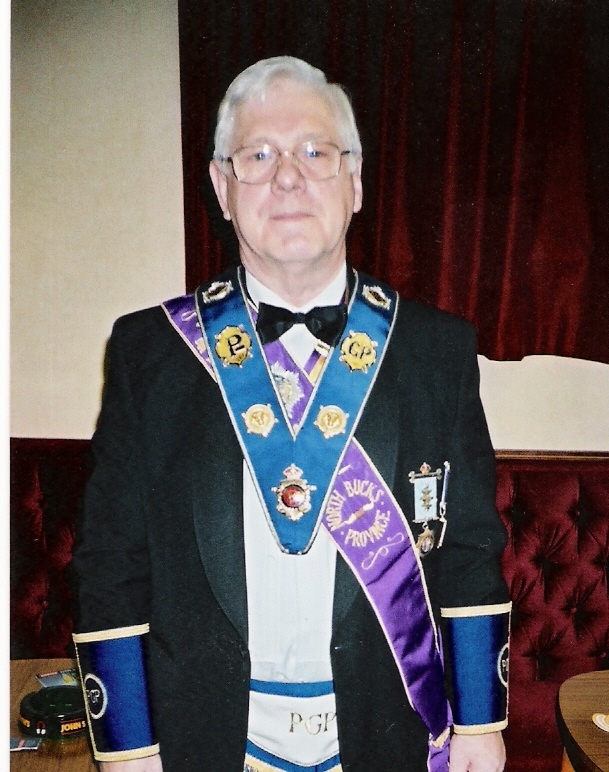 Initiated into the Order on 27/4/2002 at the No.144 Grenville Encampment (Opening night). Knight Commander of No.144 Grenville Enc., 2002. Camp Scribe of No.144 Grenville Encampment, 2003 to date. District Scribe of the Wessex District Encampment, 2005 to date. and a Past Supreme Grand Companion of the Order. Robin's son Adrian is also a member of the R.A.O.B. an ROH and P.P.G.P. , a member of the G.U.O.K.G.H. & holds the 5th degree or Senior Sir Knight Counsellor & Past Knight Commander & Past District Kt. Com. in the Order. He is also a member of the Guild Companions of the Ark [G.C.A. ], and at present holds the title of Supreme Grand Companion of the Ark.